Visiting is free. We welcome you as our guest. Imagine yourself back in time when the local artisans of a community supplied the crocks, dry goods, wrought iron tools, and decorative elements of the household. Just as well-wrought goods were handed down as heirlooms in earlier times, you will find treasures and memories to keep for yourself and others. The beautiful grounds and relaxed atmosphere bring visitors back annually. 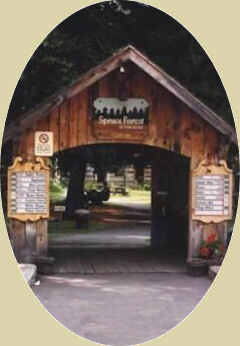 Today the Spruce Forest Artisan Village is home to ten professional artisans. No paid actors or reproduced backdrops here.....only highly skilled, articulate craftsmen in beautifully restored log cabins and other restored buildings of historic note. Established 35 years ago. Spruce Forest Artisan Village, an offspring of Penn Alps, has been a seedbed for those wishing to learn and pursue the traditional arts and crafts of our colonial roots. 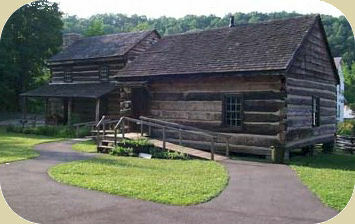 Early classes in wood carving, pottery and weaving led to locating and saving historic buildings that would allow the public to watch artisans at their craft in fully functioning studios. The early efforts of teachers and volunteers have produced a world champion bird carver and professionally trained artisans who now share their knowledge with visitors and students. Mon - Sat, 10:00am - 5:00pm, staggered days off at the studios. Special hours and decorations over the holidays, including our "Christmas in the Village" event. Similar hours but subject to weather.